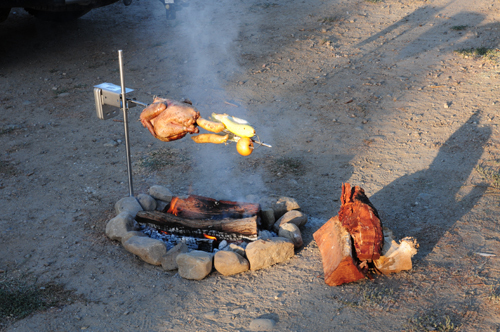 A lot of people have the notion that a BBQ spit rotisserie is an expensive and immovable piece of equipment. These days this is simply not the case. 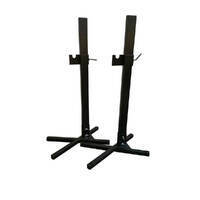 Today, there are a range of spit roasters which are remarkably easy to set up, are light weight and highly portable. 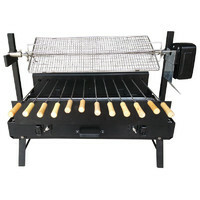 If you tend to go camping, caravanning or 4x4 regularly, you'd want a smaller spit roaster with a 3 volt battery operated motor or a 12 volt motor. 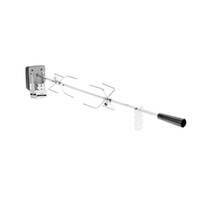 This ensures light weight, quick and easy set up/pack down and it won’t take up a lot of room in your car. 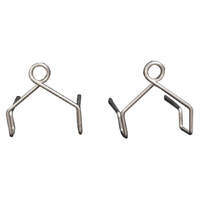 Auspits are great for cooking up to 8kgs. 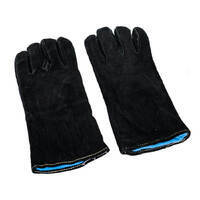 They are portable, battery operated and are packed in a small carry bag. Throw it in the car next time you’re going camping, hunting or 4-wheeling and you won’t even know it’s there. 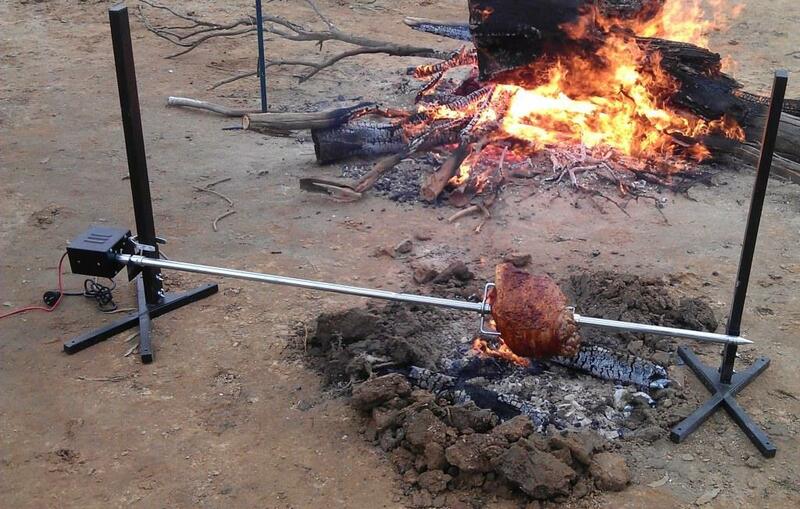 Hammer the main upright into the ground vertically and then attach the spit roast shaft horizontally. The Flaming Coals portable camping spit set is perfect for camping, sitting over a 44 gallon drum or cooking directly off the ground. It is designed with strength in mind which makes it superior than other portable spit sets available on the Australian market. 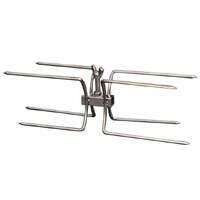 The set comes fully complete with stainless steel accessories (22mm thick skewer, 2 large prongs and a back brace), an extra tall frame, better height adjustment functionality and locking pins. 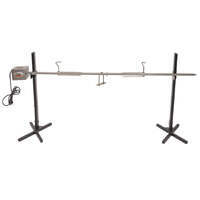 The stainless steel skewer is a 2 piece skewer which is adjustable in length. 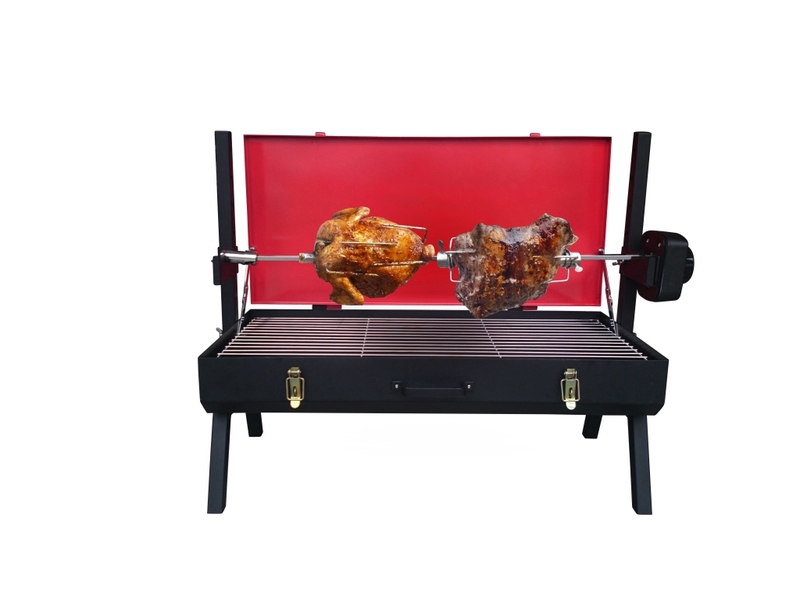 You can use this spit roaster to cook just a couple of chooks, gyros or even put a whole pig on it. This little beauty is perfect for home use or taking away. It packs away perfectly like a brief case making it easy to store and take away with you. 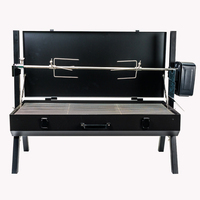 With a charcoal mini spit roaster BBQ, you can easily set up and spit roast anywhere. There’s nothing stopping you from carrying your portable spit roaster next door to your neighbour’s house or to the park on a sunny day for a memorable meal. 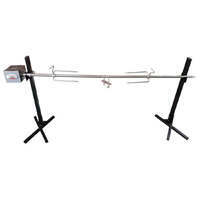 Having a portable spit roaster can be a great asset when holding a weekend BBQ or having a lively parties or gatherings. 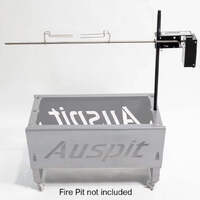 Read the story behind the design of the charcoal mini spit here and see why a alrge Australian company chose BBQ Spit Rotisseries to design the mini spit for their promotion. The Wedge is a compact, versatile and truely "Flat Pack" fire pit which has a range of uses. It's flat pack design means it takes up hardly any room in your car and you won't even notice its there. 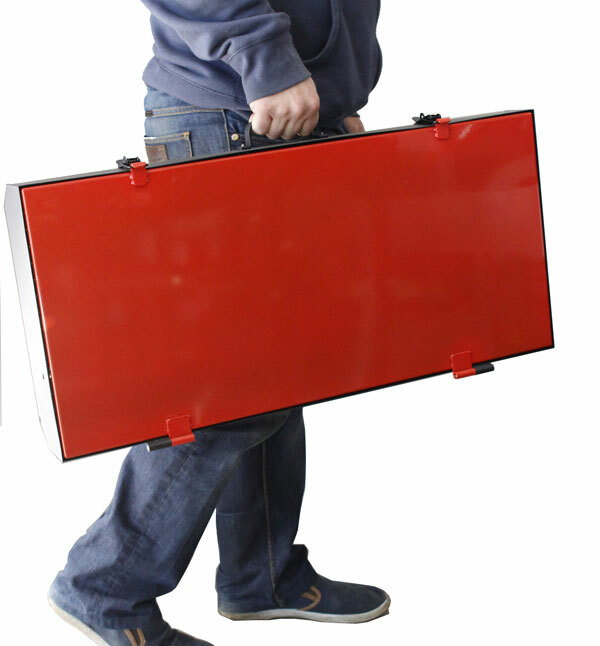 As its name suggests, it wedges and slots together in less than one minute so you don't need to carry around tools to assemble it The Wedge is Australian made by a lazer cutter out of 5mm Xlerplate steel and weighs just under 20kgs. 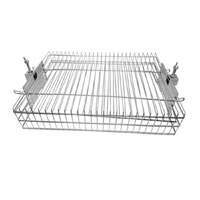 It can be used as a fire pit, as a rotisserie (if you buy the rotisserie attachment), or add your own hotplate, billy or fry pan to cook over an open fire. Check out the video to see how quick and easy The Wedge can be set up. 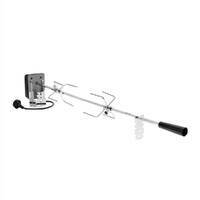 Another option to consider is an extendable spit roaster which expands and contracts in length to suit your needs. Depending on the occasion and what you’re cooking, you can easily reduce the length and cook for a small gathering, or extend it for a big occasion to cook a whole animal. 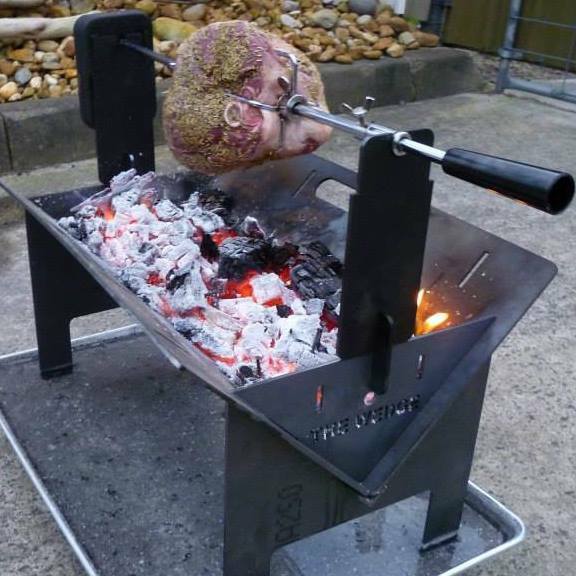 It comes complete with the charcoal tray so there's no need to light a fire on the ground. The extendable spit roaster also packs up small enough to fit under a bed!